Apple Lumps – or Burrs? I have a family apple tree, must be at least 35 years old. Over the years is has developed lumps on the trunk that get bigger every year.”They look knarled”, Can you tell me what they are, and can I treat them?. Epicormic growth like this is normal and mostly harmless. It is a cluster of dormant buds. I think it’s either a James Grieve or George Cave; those of mine that has lots of it. Does anyone know if it’s more common on particular varieties? Occasionally it sprouts weak shoots. 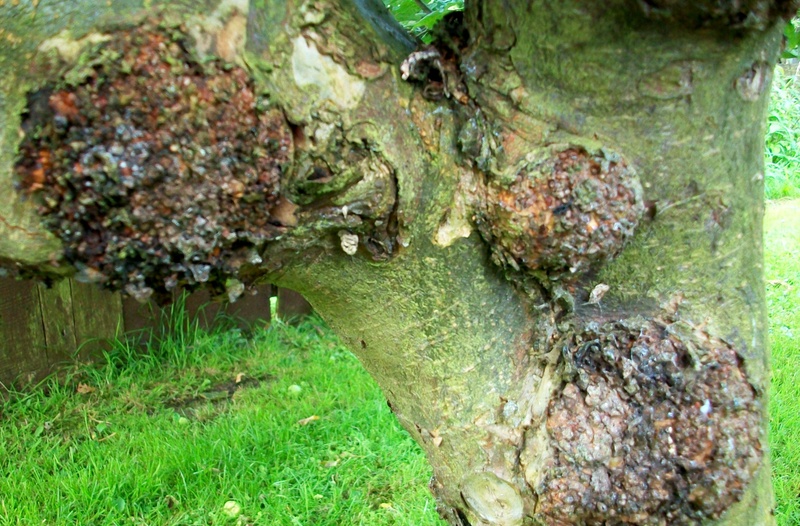 The many dormant buds can break if the tree is reduced to one of these lumps. The worst thing I find with them is that they’re a magnet for woolly aphid, and I think I can see some on yours. I wash them off with water and an old toothbrush, then when it’s dry, rub a little grafting wax over the spot where they were. You could use beeswax or pruning paint. They never come back (not to that spot anyway). The largest of these burrs are highly prized by wood-turners for their intricate ‘walnutty’ swirling grain pattern. I’ve seen large ones cut from street and woodland trees, and assume they’ve been ‘harvested’ for this use. In the case of street trees, they may have been tidied up by the council, especially lime (Tilia x europaea) which is notorious for putting on lots of this growth. This almost certainly is a manifestation of rooting cushions, usually seen developing on stems of root stock varieties. I suspect this a typical case of a tree that has in the past lost the original variety grafted on it, whereas the root stock has grown into an apple tree. Many cultivated varieties form these ‘knots’, not only rootstocks. Do not worry about them, they are a natural characteristic and are harmless.